Senators are just as aware of the politics of appointments as Obama is. Obama will likely need one or two Republicans to avoid any threat of a fillibuster; a candidate who appeals to important constituencies that Republicans also need will be harder to oppose and can help provide the 60th vote. Also helpful may be the fact that Sotomayor was first appointed to the bench by a Republican and is being positioned as a moderate or pragmatic liberal. In this respect, the careful positioning of Sotomayor as not the most liberal candidate Obama was considering helps to make her confirmation easier and also helps establish Obama’s own image as a non-doctrinaire pragmatist. 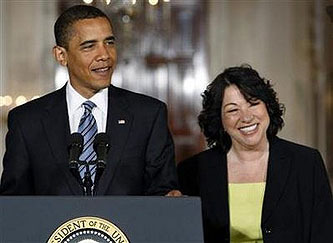 Opponents’ first claim — likely stated obliquely and only on background — will be that Judge Sotomayor is not smart enough for the job….The second claim – and this one will be front and center – will be the classic resort to ideology: that Judge Sotomayor is a liberal ideologue and “judicial activist.”….The third claim — related to the second — will be that Judge Sotomayor is unprincipled or dismissive of positions with which she disagrees….Finally, critics will characterize her as gruff and impersonable, relying on excerpts from oral arguments and anonymous criticisms in the Almanac of the Federal Judiciary. There’s more at both links. In the end, I don’t think Sotomayor will have any real trouble winning confirmation.